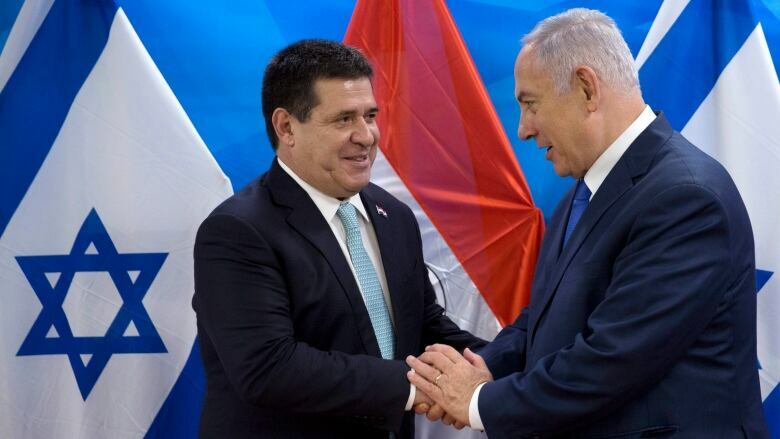 Paraguay opened its new embassy in Jerusalem on Monday, following in the footsteps of the United States and Guatemala. Paraguay operated an embassy in the Jerusalem suburb of Mevasseret Zion until closing it in 2002. It reopened an embassy in Israel in 2014, this time in a suburb of Tel Aviv. Other countries over the years have had their embassies in Jerusalem — at least 16 of them at one point in the early 1970s — but none did so when the U.S. moved its legation to the city on May 14. After moving embassy to Jerusalem, can the U.S. play a fair role in peace? President Donald Trump's announcement in December that he intended to move the U.S. embassy was welcomed by the Israeli government but infuriated Palestinians, who claim Israeli-annexed East Jerusalem as their future capital. Critics say countries that locate their diplomatic missions in Jerusalem legitimate Israel's occupation of lands, including East Jerusalem, it captured in the Six Day War in 1967. The entrance to Jerusalem was lined with the flags of Paraguay in anticipation of Monday's ceremony and Israel's Prime Minister Benjamin Netanyahu said he was there to "salute" a great friend. The opening of the embassy was "a great day for Israel, a great day for Paraguay, a great day for our friendship," Netanyahu said.